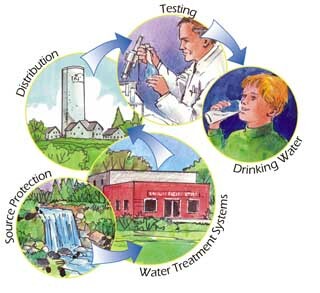 Source water protection means protecting our sources of drinking water from contamination or overuse. These sources of water can include surface water, such as lakes, rivers or streams, or groundwater. The provincial government passed the Clean Water Act in October 2006. It provides the legislative basis for source water protection planning. In 2000, the Walkerton tragedy showed us how vulnerable our drinking water can be when it is not managed properly. The Walkerton Report called for many changes to how we manage drinking water in Ontario. A number of the recommendations emphasized the need for source water protection. The report also recommended that this be done on a watershed basis by Conservation Authorities. careful and regular testing of our water supplies. Of course, the multi-barrier approach applies mainly to municipal water systems. In most of our rural areas where people rely on wells or surface water intakes for their drinking water, source water protection is often the only barrier available to protect drinking water. Source water protection planning keeps our water clean not just for drinking purposes, but also for fish, wildlife and recreation. This is vital to the Cataraqui Region with our abundance of lakes, the Rideau Canal, Lake Ontario and the St. Lawrence River. Why is the CRCA involved? Ontario’s Conservation Authorities are recognized for their watershed management knowledge, and connections to local communities. Conservation Authorities have been asked by the province to coordinate a multi-year planning process involving municipalities, community organizations, industries and residents. The plans will be prepared on a watershed basis, either for individual watersheds or groups of watersheds. The start-up phase of this project was underway during 2005 through 2007. The source protection plan was submitted to the Ministry of Environment for approval in August 2012. We are awaiting approval of the plan. The provincial government paid 100 per cent of the costs to complete the source water protection plans. The responsibility for implementing the plans will be shared between the province, municipalities, local agencies and individual water users. Detailed information about drinking water source protection is now available on the website www.cleanwatercataraqui.ca. Information about drinking water source protection is located on a separate website. Please visit www.cleanwatercataraqui.ca for the latest information about this project.